Project Schedule/Status: The pilot study is complete. The results of the study will inform the capital improvement projects that will be proposed for this area. Basin 4 is located in southeast San Mateo. The Inflow and Infiltration (I/I) Pilot Project area extended East of Eisenhower St. and Van Buren St. to the lagoon as highlighted in the figure below. The Inflow/Infiltration (I/I) Pilot Project was designed to help the City better understand how, how much, and where rain water enters the sewer collection system. The I/I project results will help the City determine the types and locations of repairs, and where to focus rehabilitation efforts. Some of these future rehabilitation efforts will include sewer pipe improvements and pump station improvements. The I/I Pilot Project results are helping the City to evaluate how, how much, and where storm water enters the sewer collection system. 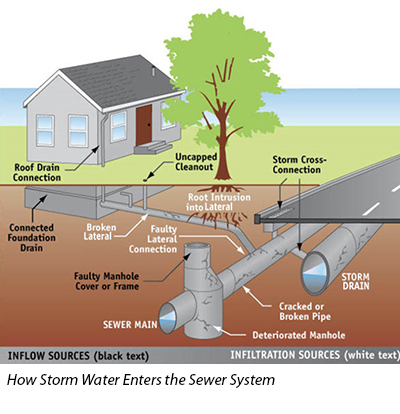 During heavy rains, excess amounts of storm water entering the system can overwhelm its capacity, causing sewer overflows. The CWP identified the I/I project as one way to help determine the best methods of reducing I/I and flows to the treatment plant and reduce system overflows. The first step was to assess the condition of the sewer collection system. Condition assessments look at sewer mains, manholes, sewer laterals, and storm drains to find cross-connections, leaks, breaks, and other pipe defects. Condition assessments in the pilot project area concluded in 2018. The condition assessment area was broken into two zones as shown in the figure below. 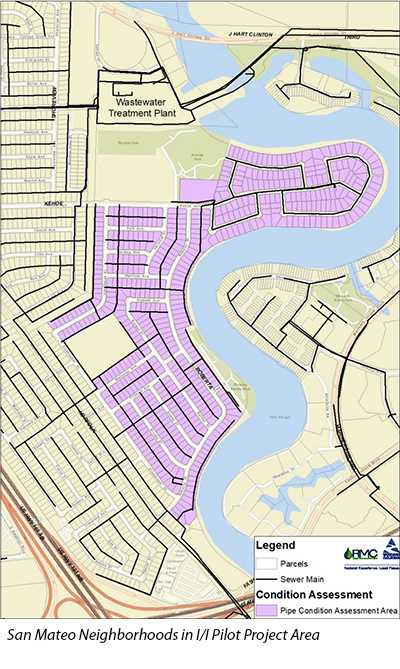 Zone 1 covered the northern portion of the Marina Lagoon neighborhood, east of the Kehoe Ave. and Roberta Dr. intersection. Zone 2 covered from Kehoe Ave. south to the intersection of Roberta Dr. and Eisenhower St., and east of Van Buren St. and Eisenhower St. to the lagoon. In Zones 1 and 2, the sewer mains and laterals were inspected using video cameras. In Zone 2, where the sewers are located in easements on private property, above-ground mapping of the laterals was conducted in addition to video inspections. Smoke testing occurred in both zones. These assessment techniques are detailed below. Sewer mains in the project area are cleaned using high-powered water hoses that are placed down the manholes. After cleaning, a remote-controlled, tethered camera on wheels travels through the sewer mains and laterals to locate and record pipe defects. The video inspections provide information about defects in the sewer pipes that may lead to repairs or replacements. In addition to the video inspection of sewer mains and laterals, residences in Zone 2 also had their backyard lateral mapped. To map a lateral, a field worker follows the lateral camera above ground using a special piece of tracking equipment. The equipment stores location data, and small flags (or other non-destructive markers) are used to mark the path of the lateral. A sketch of the lateral path is recorded. The flags or other markers are removed when the field team is finished. As part of the assessment process, some neighborhood storm drains were video inspected. The primary goal was to identify cross connections between the storm drains and sewer system. 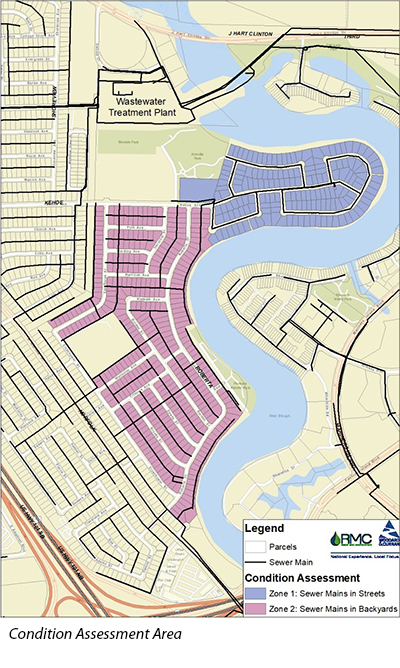 Eliminating cross-connections will help prevent storm runoff and lagoon water from entering the sewer system. Smoke testing helps to locate cracks and other openings or connections where rain water might enter the sewer collection system. A non-toxic smoke is blown into parts of the sewer system, and it will follow the path of any leak. As shown in the figure below, potential smoke release locations include roof vents, catch-basins, clean-outs, roof down-spouts and pipe and manhole defects. The smoke is clean and non-toxic to humans, pets, food, plants, and material items and no smoke will enter a home or business if it is properly plumbed, vented, and the P-traps contain water. Depending on the results of the video and smoke inspections, some sewer mains and storm drains may have needed additional testing done to help locate the source of any cross connections. At this time, no tracer tests are planned. The Clean Water Program is conducting an analysis of potential sewer main improvement projects within the Basin 4 area. With the help of hydraulic modeling, the analysis will determine the locations where improvements are needed the most to reduce the likelihood of sewer overflows. Improvements may include enlarging and/or rerouting existing sewer mains to increase capacity and more effectively transport waste within the sewer system. Pump stations lift wastewater from low elevations to high elevations so that it can continue flowing by gravity from homes and businesses throughout the city to the wastewater treatment plant. Increasing the pump station capacity to move wastewater is another way to reduce the risk of sewer system overflows within the community.